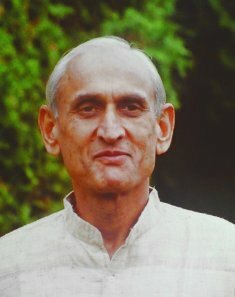 All material on this website has been adapted by seekers from original recordings of Satsangs and letters of Gurudev Shri Ojaswi Sharma. What I am trying to tell you is that, from the outer to the inner, going deeper inside, we reach a stage when there are no thoughts, but we are still there. You cannot be absent in any situation, and you are not the thoughts. You are there - the consciousness is there - the awareness is there - without thoughts. Is that not a state of complete silence? Only thoughts break the silence. What else? Our annual Satsangs in English are planned from Monday 13th February to Saturday 25th February 2017. Gurudev has been ill for some time but recently has undergone an operation and recovered remarkably well. Therefore he was in full health for this year's Gurupurnima which took place on the 19th July. Click here for a translation of his message. For any questions or comments you will find our contact mail on the "About us" page. All want to be happy and yet very few people have permanent happiness in their life. Why is it like this? The answer is that, due to their ignorance, people do not know that the only purpose of human life is the attainment of permanent peace and happiness. The mistake they make is that most people seek happiness in the external world but this happiness exists already in their inner self. This attainment of one’s innate happiness and peace is variously known as Self-Realisation, Liberation, Moksa, Nirvana or God-Experience. Wise people lead their life in such a manner so that this single aim of human life is realised before their death. They alone are fortunate while the rest find nothing but misery.